The rudder of a 17th Century merchant vessel shipwrecked off the Dorset coast has been brought ashore. The so-called Swash Channel Wreck was discovered in a sand and shingle bank outside Poole Harbour that was struck by a dredger in 1990. Its 8.4m (28ft) rudder, carved with the image of a man's face, was lifted onto Poole Quay by Bournemouth University marine archaeologists, at 08:45 BST. Little is known about the name and origins of the vessel and its crew. A £450,000 conservation project funded by English Heritage has already seen several parts of the ship raised, including rare examples of carved Baroque woodwork. Almost 80% of the port side of the Dutch ship survived since it sank early in the 17th Century. In the shadow of the modern car ferries bound for France, part of a ship from a very different maritime era was raised out of the murky waters along Poole's quayside. The ornate carved face on the rudder head is the centre of attention, immediately sprayed with water to prevent it drying out in the sunshine. The team of marine archaeologists looked on with pride at the culmination to hundreds of hours spent diving the Swash Channel Wreck site. Next port of call is York for specialist conservation work and hopes that something more can be learnt of the history of this mystery wreck. 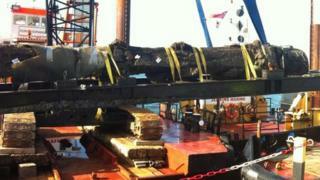 The rudder was raised from the wreck site in July and has been kept underwater at Poole's quayside. It is due to be taken to York for conservation and research work to be carried out on it. Dave Parham, from Bournemouth University, described it as "spectacular" and said he was relieved it had been brought ashore "in one piece". "Up to now we could only see a few metres of it underwater," he said. "Now it's on shore you can see everything in the light - it's huge, it's an incredible sight." The rudder is the last major piece due to be raised. The wreck has since been covered in sand to protect it from the seawater. Along with other artefacts, it is due to go on show in Poole Museum in two years time.